Radio in India is ready for another leap forward. After private FM channels revived the dying medium in 2000, the story is on the verge of a fresh turn with Phase 3 of the licensing auction, which promises to unleash the full force of radio in every nook and corner of the country. With the possibility of over 800 private FM radio channels in 283 cities, most of them small towns, the potential of radio is like a gold mine waiting to be tapped. Ashish Pherwani, associate director, media & entertainment practice, Ernst & Young, spells it out: Once a radio company is permitted to operate multiple frequencies in a city, there will be more niche programming, which will widen listener base. All this will improve margins and the abysmally low number of profitable radio companies should increase. But before Phase 3 policy is announced, industry players have to cut through the challenges they currently face. Extension of licence period to at least 15 years is one of our major expectations, as the current ten-year period is not enough to even recoup costs, let alone make profits. Getting reasonable rate and volume of the Directorate of Audio Visual Publicitys (DAVP) ads in radio, especially allowing news and sports content and lowering of Prasar Bharti rentals to reasonable values are some issues that need immediate attention, says Anurradha Prasad, president, Association of Radio Operators of India. Lack of efficient monitoring is another operational issue that plagues the radio medium. RAMs (Radio Audience Measurement) lack of seriousness in investing into the medium has not progressed beyond four cities and the small sample sizes provide statistically insignificant data and make a 250-town industry look small to advertisers, says Vineet Singh Hukmani, MD, Radio One. And with talks of existing channels looking for new investors to even renew existing licences doing the rounds, it clearly reflects the confidence of existing investors, he adds. Though expected to grow at a CAGR of 16% over 2010-14 and reach a size of Rs 16.4 billion by 2014, radio also suffers from neglect by advertisers, something industry players hope will change with Phase 3 auctions. Here, too, players are worried that with most additional frequencies to be available in smaller towns, it may not be as attractive financially if prices remain at previous phase levels. Channel operators are also hoping that the government will consider their demands for allowing broadcast of news on private FM channels, permit one radio company to hold multiple frequencies in a city, increase the number of available frequencies (perhaps by reducing intra-frequency gaps) and allow increased co-sharing of facilities between stations. KPMG Indian Media & Entertainment Industry Report cites, cost structures continue to be a concern. And, despite the radio industry accounting for around 4% of the total ad spend in India, attracting over Rs 800-crore advertising revenue, the pessimism persists. S Keerthivasans story is a case in point. He quit his job in the corporate world to venture into the radio business. Instrumental in a collaboration between Virgin Radio and HT Media Ltd, he launched Fever 104 FM. Four years later, Keerthi (as he is popularly known) is satisfied with the success of his latest venture Radio Ramayan, but is not too enthusiastic about Phase 3 of auctions. While local advertisers do exist in smaller cities, the costs involved make business non-viable. 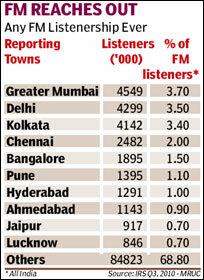 Radio is a big city business, feels Keerthi. He also predicts that the future will not see more than three to four players in the market, as its a tough business with profitability a gigantic task. There are too many players in the market and they are bleeding, failing to innovate and capture the market, says Keerthi. The sentiment is echoed by Hukmani of Radio One. The radio industry has the lowest return on capital. Yes, there is revenue growth, but return on capital invested is dismal. Existing and new investors will shy away from this medium as profitability is not commensurate with investment, he says. While smaller players like Fever and Radio One could cushion their losses owing to their limited spread, the bigger players are finding the going tough. Prashant Panday, executive director & CEO, ENIL, which owns Radio Mirchi, believes the radio story is only partially developed. Its been a terrific ride, thought for most broadcasters, a financially bleeding one!. Still he believes that the real growth of radio will come when Phase 4 comes into being, which will double the number of channels in major markets from the present 10-11 to nearly 25. The government just needs to halve the separation between two frequencies from the present 800 KHz to 400 Khz to allow doubling of channels. With most people listening to radio on digital receivers (mobile phone, at home or in car), 400 KHz is more than enough separation needed. And with this, the share of radio should rise to anywhere between 9-12%, the same level as in countries where radio has developed well (US, Canada, Australia, New Zealand, South Africa, Philippines, Sri Lanka), he suggests. Soumen Choudhury, business head, 92.7 BIG FM, believes that opening up of newer markets and multiple players in the existing market will help the sector. From a content perspective, news and sports will beef up the mediums ability to attract newer audiences as this category has a national average of 25% penetration (metros and non-metros put together), which will most definitely see an upswing with newer forms of content, he adds. Currently being limited by the number of stations licensed out, growth can only come from increased ad volumes and increased ad rates. Several radio companies are working around alternate revenue streams like song downloads, music books, cafes, Internet radio and mobile radio; however these are yet to reach a significant revenue level for radio companies, says Pherwani of E&Y. Apurva Purohit, CEO, Radio City, feels there is going to be a plethora of offerings with multiple frequencies slated to be auctioned in Phase 3 of the FM policy. With close to 30% of all FM listeners tuing to radio on the mobile phones, 3G is likely to propel growth of radio in uncharted terrains, she adds. While experts see radio becoming more audible in the next decade, a lot still depends on the upcoming Phase 3 of the licensing auction, which is fuelling new hopes for this mass medium.